"This hearty slow cooker dinner will fill your kitchen with a delicious aroma and isn't that same old chicken and cream-of-something slow cooker meal. Serve it with a crisp green salad and a loaf of crunchy bread for a stick-to-your-ribs dinner. This tastes better the longer it cooks, so letting it cook on Low for an entire work day will only improve the taste." Heat oil in a large skillet over medium heat. Cook the sausage until well browned, 5 to 7 minutes. Stir in the onion; cook and stir until lightly browned, 5 to 7 minutes more. Remove the sausages, and cut them into 1 1/2-inch to 2-inch pieces. Pour the beef stock, tomatoes, tomato puree, and hot sauce into the skillet with the onion and bring the mixture to a simmer, scraping up any brown bits from the bottom. 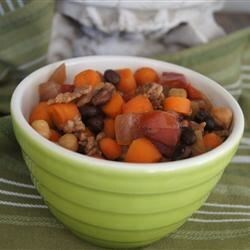 Place the carrots into a slow cooker, followed by the garbanzo beans and kidney beans. Arrange the sausage pieces on top. Pour the sauce from the skillet into the slow cooker.